Bought about $1,280 dollar in halves today. Scored whole rolls of 1964, 40% and a whole roll of walking liberties and tons of 40%. few rolls of 90%. Not a single Franklin though. The person who turned them in had their name on every roll. Some of them were marked silver with the year written. Still have a few rolls to open live and I believe to be whole silver rolls too. All the loose coins is mixed silver half dollars all from just today. Last edited by needler420; 08-25-2018 at 08:53 PM. Holy moly. I'm picking up my first box from the bank today. Seeing posts like this are really setting me up for some disappointment! Got 41 1964 about 100 40%ers and a full roll of walking liberties so far. Still have about 15 rolls to unwrap and I know they have silver after checking the enders. Going to shoot a video later. All were hand customer rolls. No boxes. Somebody's in trouble for turning in Grandpa's coin collection. Just.......wow...... can’t say anything else.....speechless! Poor old Gramps croaked more than likely and he was a hoarder...just never got around to telling his next of kin what it might be worth...so off they ran to the bank and cashed it in for all paper money! Around KT's realm that would have to cycle through Loomis first because the local banks do not take rolled coins, make the holder go rip the rolls and dump then in the coin counter machine...KT will never have a chance to make that kind of hit, unless he has a very understanding teller who takes the stuff in with KT in mind! One never knows, has happened once...KT bought from a teller $48 in halves and recovered 18 40%ers in the lot. Needler, Royal congrats on another great take! Best of luck in the near future! Sure glad you are down in Florida and KT is in Arkansas! Last edited by needler420; 08-24-2018 at 05:55 PM. Great Gimlis Ghost! Sweet Shards of Narsil! What a hoard reward! Poor old G'pa be spinning in his grave! My dad saved every single silver coin he ever found in a big glass water jar. When he died, my sister rolled up all his coins and got $1800 from it. All silver. That's an EPIC score, wow man! WOW...you hit the Holy Grail of coin rolling!! Major CONGRATS! And of you are not back at that bank tomorrow picking up quarters and dimes hunting for more hand rolls then send me their address and I will. I will be going to their other branches local in the area as well as getting some other denominations from the same bank to hunt. 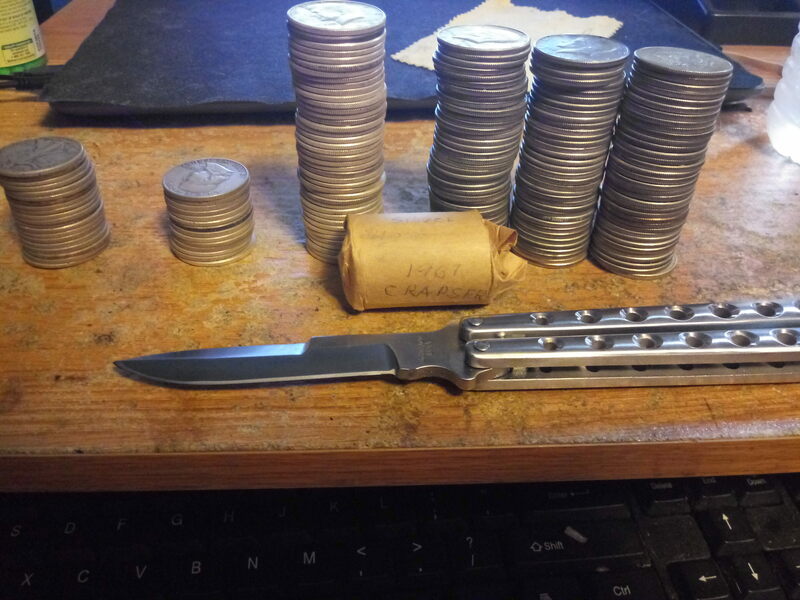 I'm debating making my own coin roll hunting tips video. Holy Cr@psers! You were in the right place, doing the right thing, at the right time. Coingrats on that one! All these posts kill me, any of the local banks I go to never have more than a couple half dollars. More less rolls of them. Can’t even get presidential dollars unless they just happen to have 1. Yes 1. My banks has whole sets uncirculated. If you want one for face value let me know.